Boil eggplants in water until cooked, about 7-15 minutes. Cut eggplants in half lengthwise and scoop out the pulp. Mix this with cheese, almonds and eggs. Stuff the eggplant skins with this. Grease a baking dish olive oil. 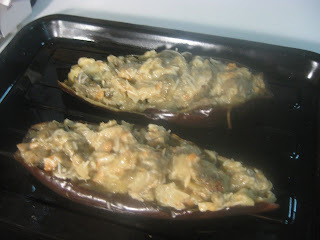 Add stuffed eggplants. Place in oven about 4-5 minutes until the cheese melts and the crust browns.